Swords are not only weapons, but symbols of great power, used over the centuries as offerings, in ceremonies, for coronations, and as precious items for trade. Over the years, a number of swords have been unearthed, bringing with them centuries of legends and incredible tales, linking them to famous figures and folk heroes. 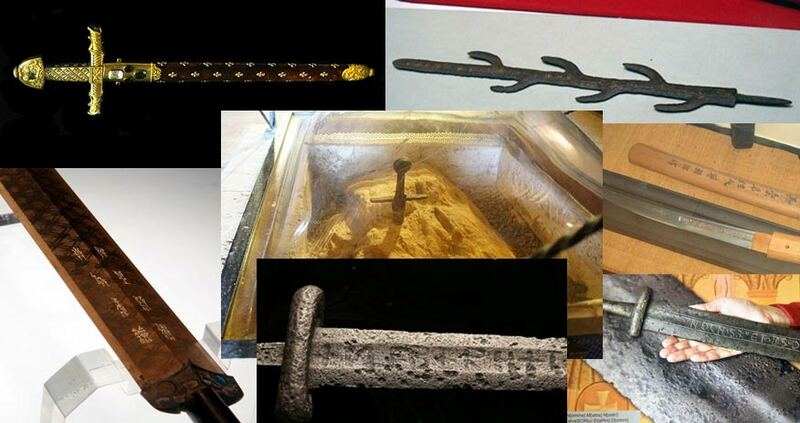 Here we feature ten striking swords from the ancient world. The sword of Joyeuse, which today sits in the Louvre Museum, is one of the most famous swords in history. Historical records link the sword to Charlemagne the Great, King of the Franks, who reigned some 1,200 years ago. The sword of Joyeuse was used in countless coronation ceremonies, and is tied with ancient myth and legend ascribing it with magical powers. The Isonokami Shrine is a Shinto shrine believed to have been built in 4 AD. Located in in the foothills of Tenri in Nara prefecture, Japan, this shrine is culturally significant for it houses several national treasures, including a legendary sword known as the Nanatsusaya no Tachi, or ‘Seven-Branched Sword’. An inscription on the blade reveals the Seven-Branched Sword was given by the king / crown prince of Baekje (an ancient kingdom in the south western part of the Korean Peninsula) to the king of Wa (ruler of Japan). The delicate nature of the sword branches suggest that it was never intended to be used as a weapon, but rather served a ceremonial function. Inside a glass case in a round chapel on top of Montesiepi in Tuscany, Italy, is a 12 th century sword lodged within solid rock. According to legend, the sword was placed there by San Galgano, a fierce knight and wealthy nobleman, who converted to Christianity following a vision of Archangel Michael. The story goes that San Galgano was walking on Montesiepi when he saw another vision of a round temple with Jesus and Mary surrounded by the Twelve Apostles. A voice spoke to him, commanding him to renounce all his worldly desires. San Galgano replied that this was as easy as splitting stones with a sword, and with that he drew his sword and thrust it into a stone. To the saint’s great amazement, the weapon went through the stone like a hot knife through butter, and has been stuck in the stone ever since. Fifty year ago, a rare and unusual sword was found in a tomb in China. Despite being well over 2,000 years old, the sword, known as the Goujian, did not have a single trace of rust. The blade drew blood when an archaeologist tested his finger on its edge, seemingly unaffected by the passage of time. Besides this strange quality, the craftsmanship was highly detailed for a sword made such a long time ago. Regarded as a state treasure in China today, the sword, which was once owned by Emperor Goujian of Yue, is as legendary to the Chinese people as King Arthur's Excalibur in the West. Muramasa Sengo was a legendary swordsmith who lived during the Muromachi period in Japan (14th - 16th centuries AD), and was said to have been completely mad and prone to bouts of violence. It was therefore believed that these destructive qualities were passed by the master swordsmith into the blades he forged. The blades would then ‘possess’ their wielders, turning them into insane and deadly warriors, just like Muramasa himself. Despite the bad reputation surrounding the blades Murasama forged, they were undeniably of high quality, and were popular in Japan. However, during the reign of Togugawa Ieyasu, the first shogun of the Edo period, Muramasa’s blades fell out of favour. The shogun’s father and grandfather were both murdered by their retainers who were wielding Muramasa blades and so it came to be thought that Muramasa’s blades carried a curse again members of the Tokugawa family. Consequently, the shogun banned ownership of the Muramasa. Today, just a small number of the rare blades remain. Over the years, around 170 Viking Ulfberht swords have been found across Europe, dating from 800 to 1000 AD. The swords were made of metal so pure, and crafted with such high quality, that many say they were centuries ahead of their time. The Ulfberht was made with crucible steel, which has a carbon content three times higher than that of other metals of the time. It was believed that the technology to create this metal was not invented for another 800 or more years, during the Industrial Revolution. It was initally believed that the swords originated in the Middle East or Asia, but research revealed the materials were sourced in Central Europe. It is possible, however, that the material and the know-how came from the Middle East. The Volga trade route between the Viking settlements and the Middle East opened at the same time the first Ulfberhts appeared and closed when the last Ulfberhts were produced. In 1975, archaeologists stumbled upon a mysterious medieval sword made in Germany, adorned in Sweden, and found in Siberia. Researchers were perplexed as to how a 12 th century European sword came to be found on the banks of the River Om in the remote Novosibirsk region of Siberia. Detailed investigations suggest that the sword may have belonged to Tsar Ivan the Terrible, given to him as a gift, and was then used by legendary warrior Ivan Koltso in battle ahead of the conquest of Siberia led by Cossack leader Yermak Timofeyevich. In July 2014, a strange discovery was made on the banks of a small stream in Georgia, USA – an exquisite Chinese votive sword fashioned in Lizardite. The symbols carved into the sword, including a dragon head and grotesque face mask of the Taotie, are found on jade objects from the Xia (2070-1600 BC), Shang (1600-1046 BC) and Zhou Dynasty (1046-256 BC). The rare artifact gives further weight to the theory that the Chinese traveled to North America before Christopher Columbus ever reached its shores. The master craftsmanship behind Indian swords was highlighted when scientists and conservationists from Italy and the UK joined forces to study a curved single-edged sword called a shamsheer. The design is of Persian origin, from where it spread across Asia and eventually gave rise to a family of similar weapons called scimitars being forged in various Southeast Asian countries. It was established that the steel used is quite pure. Its high carbon content of at least one percent shows it is made of wootz steel. This type of crucible steel was historically used in India and Central Asia to make high-quality swords and other prestige objects. Embedded high up in a rock in Rocamadour, a pilgrimage site about 160km to the north of Toulouse in France, is an iron sword with legendary origins. According to local accounts, the sword, called Durandal, had been given to Roland a prominent figure in medieval European tales. Roland is said to have been the nephew of the famous Holy Roman Emperor, Charlemagne. He was also considered to be the greatest of the Twelve Peers, the best warriors of the emperor’s court. The best-known legend regarding Roland is probably that of his last stand at the Battle of Roncevaux, an actual historical battle that was later romanticized into a major battle between Christians and Muslims. The sword Durandal was said to be imbued with great powers, so much so that Roland attempted to destroy it in order to prevent it from falling into the hands of the enemy. It is said that he flung Durandal into the air, where it magically landed wedged in the rock in Rocamadour, where it remains to this day. I wonder if the pure metal was from a meteorite. I looked it up. I'll agree that its true origins are uncertain. Still seems very far fetched that a few "miracle swords" were made locally even though there technology had been around more then a thousand years further east. Especially since we know there was trade between the regions for millennia. A lot of history is biased by writers/scientist and history rewrites itself constantly. Since the science is not definitive or peer reviewed, it might be possible...but not likely that the blade steel was from Germany. The minerals analysis was done on one sword and only the pommel and hilt supported there claim. Consider this. Weapons technology during war spreads fast. In the time of Ulbrecht there was little development and a lot of war. There were multiple swords made over 2 centuries(??). Why would they not mass produce these locally sourced swords if it was in there capability? "Lehman made no mention of isotopes just the mineral composition." Misremembered that part of the article, but his mineral test of the blade did determine that it had a higher manganese content than eastern steels. He took the position that the materials were not sources from the Middle East. There is more academic evidence from him and others against an eastern origin of the blade steel, if you look up Lehman, or Alfred Geibig. Making the sword from local materials was certainly possible, however more complicated and strenuous. Jack, only the pommel and guard had trace minerals distinctive of the region. The sword blade, made from a single or combined ingot is still most likely middle eastern or Asian in origin. What are the isotopes you are referring to? Lehman made no mention of isotopes just the mineral composition. He also stated that the sword may have been assembled in Germany. "Assembled" is not the defining origin of the steel. And yes, the Indians need to be more assertive with their history. Not "Hindu's"...the word Hindu is a collective term used to describe followers of the vedic books. the term-use and use is just 200-300 years old. Pakistan an Bangladesh are also part of the same history dating ban 10.000 BC...colonialism will do that to a country/people/culture. The iron was sourced from Germany according to isotope tests. Not middle eastern technology. The Ulberht sword was probably made by Christians. It has a Frankish name engraved on it in Latin alphabet with a cross. Wootz steel and "Damascus steel" predate Islam by centuries, but there seems to be an unwritten rule that nobody give Hindus credit for anything.